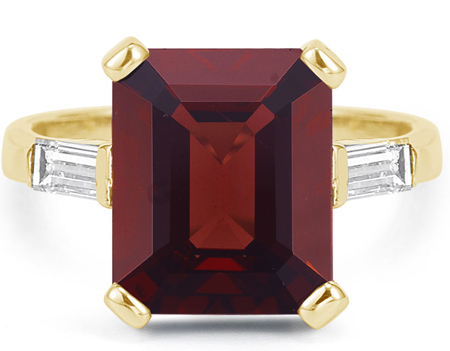 This beautiful ring features a 5 carat, AA rated wine colored garnet stone with an emerald-cut, flanked by two dazzling diamonds and set in a warm 14k gold that brings out the beautiful, deep color of the garnet! With 0.30 carats of diamonds, rated H-I for clarity and SI for color, Apples of Gold Jewelry offers this stunning and authentic emerald-cut garnet ring with a 11mm x 9mm size that is perfect for all occasions, and is sure to make your outfits pop! We guarantee our 5 Carat Emerald-Cut Garnet and Baguette Diamond Ring, 14K Yellow Gold to be high quality, authentic jewelry, as described above.